If I wasn’t a knitter I wouldn’t have the good fortune of making hard choices such as whether to do another shawl, or finish the socks first, or finally cast on for that fair isle sweater I’ve been telling myself for the past year I was going to start ‘next’. If I wasn’t a knitter I wouldn’t be making things that look like this. Enough said, right? I’m so glad you’re all knitters, too. That is beautiful! Inspiration for me to finish some of the lace I have OTN. Huzzah, huzzah for knitting! 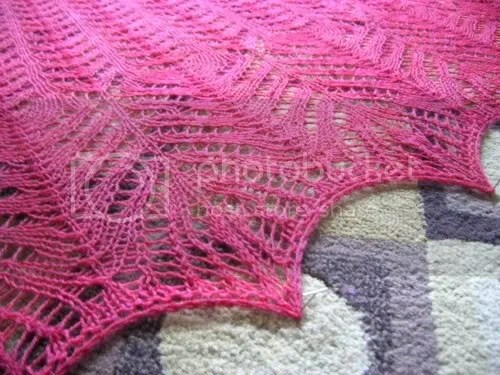 The shawl looks gorgeous, and the hot pink puts a very different twist on the pattern. Wow, that’s stunning! I love this shawl and pattern. 🙂 Also really like that pink colour, so vibrant. I wish I had more time to knit. Stupid uni. I’m sure you know how it is! It is beautiful! Good work! 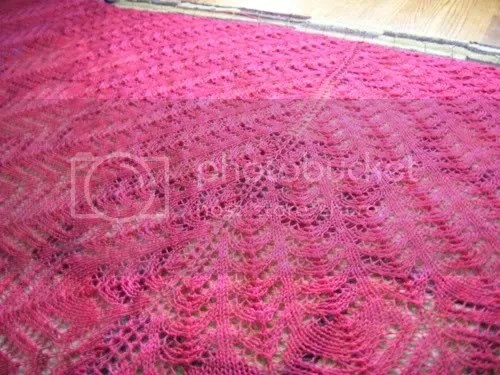 All that fushia I see makes me want to knit something in that color too! It must have been fun! Congratulations! Absolutely stunning piece of work! Maybe one day I’ll have the courage to try lace like that. For now, I’ll have to be content with finishing my feather-and-fan scarf. Beautiful and I love the colour! And – what you said! So gorgeous! And the colour is just spectacular!! I’m so glad you can share and inspire. Thanks! Brilliant combination of color and pattern — really original. Mmmm, I saw this earlier on your Ravelry page, it is absolutely beautiful! It is gorgeous. I LOVE the color and pattern. Perfect for Spring! It’s beautiful, and knitting is a kind of magic isn’t it?? Yep, it’s great being a knitter! Once again, so impressed by you! It is beautiful! That is the perfect color of raspberry. Gorgeous!! That colour is lovely. I was feeling the exact same way last night, as I blocked out the recently completed swallowtail shawl. I don’t have any FO pics yet, but the giddy feeling of seeing all that lace reveal itself….ah, so satisfying!! !